Posted: Mon Jun 28, 2004 6:46 pm Post subject: Iran Under Curfew!! The terrorist occupiers put all cities under tight Military Curfew! Students and activists are robbed from their home and streets, their dead corps found days later! Activists are called to courts to sign an agreement not to participate in July 9th rally. hundreds are arrested everyday throughout Iran. All streets are packed with armed forces, and special gaurds. This is the making of a Military Coup! NO MORE OIL FOR THOSE WHO SUPPORT IRI. NO MORE IRANIAN BLOOD FOR EU OIL! A FRIEND FROM AHWAZ HAS CONFIRMED THIS WHEN HE WAS CHATTING WITH ME YESTERDAY.. HE SAW FROM HIS WINDOW A LOT OF POLICE FORCES IN THE STREETS. 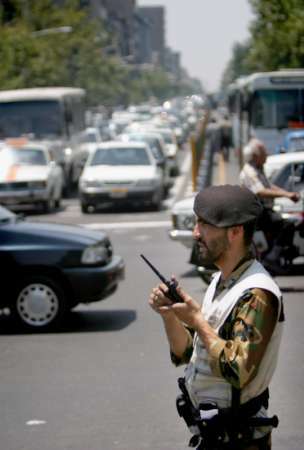 KRSI: Students from Iran report large number of arrests in all streets of Tehran. "IRI forces are rounding up the youth in major streets of Tehran, shoving them into Buses and taking them to unknown places!" Yes, and i wish that Repression against the young protestors won't be more brutal then last years.. In that case, surely those who did not show their solidarity (the italian movements),ought an apologize..
BECAUSE VERY OFTEN SILENCE MEANS APPROVAL AND IS ACCOMPLICE OF THOSE WHO COMMIT HORRIFIC CRIMES..
Zakeri is reporting that even more units of Lebanese Hizbullah, some 3000 trained killers in all, have entered Tehran. According to the leak they flew in from Dubai�s international airport, supposedly a US ally, and have set up headquarters on Takhti and Piruzi streets. Let them all come over! They will enter Iran live and exit on coffins. IRAN WILL BE THE GRAVEYARD OF HIZBOLLAH! Hey you lebanese hizbollah scumbags: tell all your hizbollah friends to come over. be our guests! we need lots of corps for Protection!!! guys have your cocktels ready. Say hello to the lebanese hizbollah! Posted: Thu Jul 01, 2004 2:40 pm Post subject: NANG BAR TAZIAN!!! Regime's Thugs are rounding up women and even younger teenage girls and taking them to PRISON with stupid charges as small scarf or low cut pants!!! they are forcefully pushed into cars and taken to Prison and not allowed to even contact their family! Is this the ISLAMIC JUSTICE? or is it the DEMOCRATIC IRAN decrared by EU & US foreign office? There are reports of a growing number of VIOLENT BEATINGS in STREETS; and many have been TORTURED in PUBLIC when the gaurds forcefully insert their legs into bags full of Roaches!! Ultimately they are only helping to further radicalise the situation. All the arrests are recruiting more people for the movement. And the second one of their Hezbollah thugz hurts an Iranian, the blood of Iranians will start to boil. Iranians will not stand around watching Arabs killing Iranians, that is guaranteed! The Mullah$ have stayed in power by carefully balancing repression with leaving people alone. They are tipping their own scales dangerously now, its understandable given their desperation. This is a dangerous game, they tip too much to one side, be it the lax side or repressive, they are in serious danger of falling and collapsing. Tipping heavily on the side of repression will have consequences, and that is further radicalsiation of the situation. The regime has lost all legitimacy with the majority, and it will lose legitimacy with the remaining minority with these actions. There is a point at which the 'winds of change' will overwhelm the Mullah$' balancing act no matter what side they tip in. All of this may work for 18 Tir, but what are they going to do after that?! As part of the regime's terror campaign especially against young people, the regime's Baseej forces (Islamic Militia) attacked a bookstore in Tehran, beating up the young people in there. According to received reports, on the morning of Wednsday, June 30th, Baseej thugs brutally attacked the "Amir Sharifi" bookstore in Imam Hossein avenue, on the way to Damavand, and beat up the boys and the girls in there. A student from Rafsanjan university died from a heart attack as a result of the severe pressures he was under. Amir Salari was a student of Rafsanjan university who was expelled from the university last year becasue of his activities. Mohamad Reza Nesbabdollah, a member of the United Students wrote in a letter that: "He also ended up like me, without the possibility of continuing his education at Rafsanjani's children's unviersity in Rafsanjan. He was physcially attacked very brutally by unknown people recently. Amir, thanks to the university's Herasat officers (regime's operatives) and head of the university was already destroyed. Amir did not leave us with a heart attack, but they gave him a heart attack as a gift". Afarin be Javanan e Dalir e Hamedan! Bravo to the Brave Youth of Hamedan! In preparation for Khameni's visit to Hamedan, the people of Hamedan especially the youth have been tearing up promotional posters and pictures of Khameni at night. There are reports of the regime's militia guarding these pictures at night to prevent vandalism, but despite all of this, Hamedan's brave youths have managed to tear up and destroy the pictures. Posted: Mon Jul 05, 2004 6:10 pm Post subject: MARG BAR JOMHORIYE ESLAMEE!! These filthy savages (Loyal IRI forces + Foreign Fighters) will be taken care of very soon! Hamashono shahid mikonim! and we'll send them to join their big fat Ayatollah-Daddy in HELL!